Yesterday evening as we were leaving Din Tai Fung (an excellent Taiwanese chain of restaurants specialised in yummy dumplings) and walking on Nanjing Xi Lu, we saw a small group of paparazzi waiting for someone to leave the Ferragamo store and enter a car waiting just outside. Then we saw a young lady, dressed in a short champagne sequin dress, leave the place and get into the car under the excited eyes of photographers and some passer-bys. Out of curiosity, I asked a foreigner with a big camera who she was. He didn’t seem to know much despite his camera but told me she’s an actress called “Sūn Lì”. Not being experts in Asian cinema, apart from the big international stars, we didn’t feel particularly enthusiastic about the encounter as we had no clue who she was. We carried on our walk on Nanjing Xi Lu, slowly making our way home. Two or three blocks later, by the newly opened massive Louis Vuitton store, we saw that same car stop, with the same bodyguards all dressed in black shirts and trousers getting out first. I told J.: “There she is again” and, encouraged by the excitement around, I screamed in my totally toneless Chinese accent “Sun Liiiii”, ran towards the car and took a shot of her with my phone. I hadn’t realised I had actually come quite close and there she was, she looked at me and gave a nice big smile to her only lǎowài* groupie while I continued to fake it. One of her many bodyguards then gently blocked me from getting any closer to her while J. stood a bit further, totally dumbfounded by my infantile behaviour. Once at home, I looked her up. 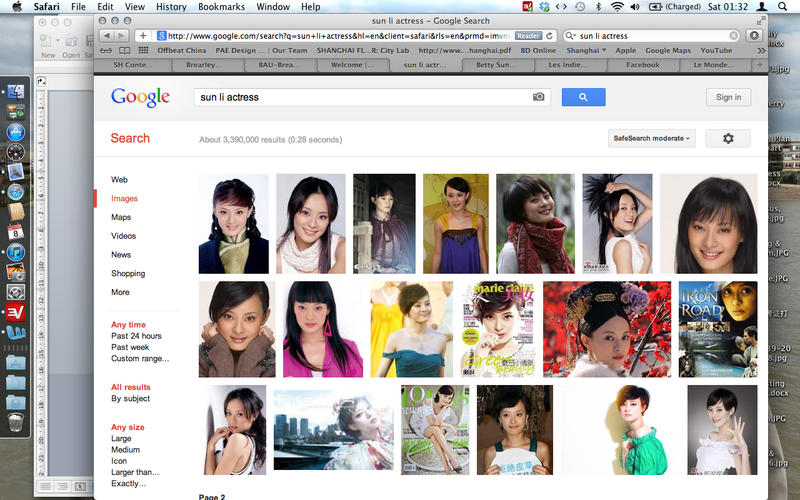 It turns out she’s also known as Betty Sun Li and is more of a soap opera comedian but her cinema career is taking off. Her latest films are “Mural” or “The Lost Bladesman”, neither of which sound familiar to us. Anyway, she was cute enough and, until we meet Jackie Chan, Zhang Ziyi, Chow Yun-Fat or Fan Bingbing, that’s the closest we got to Chinese celebrity. Wlek tekram 3younak ya Ammoura!